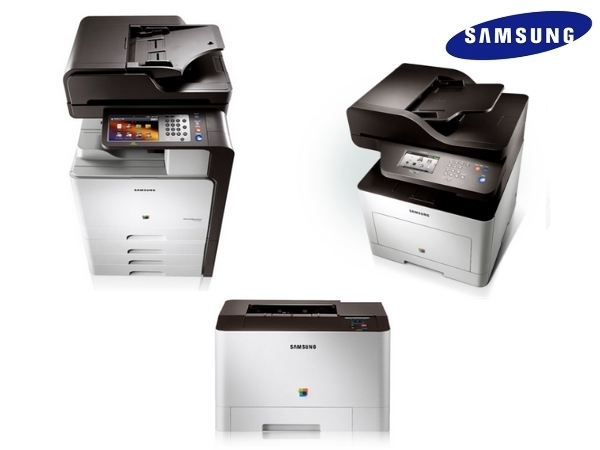 Samsung has recently unveiled its future ranges of color A3 and A4 printers and MFPs - eleven new models in all. There is a new black and white design for all these machines, and the launch includes three A3 color MFPs which are probably intended to be the new A3 entry-level range for Samsung. These MFPs, the CLX-9201 (20/20 ppm), CLX-9251 (25/25 ppm) and CLX-9301 (30/30 ppm) each have 7-inch touch screens, print resolution up to 1200x1200, a new all-in-one motherboard with a 1 GHz dual core processor, and an internal stapling unit. As for A4 MFPs, five new models are available: the CLX-3300, CLX-4195, CLX-6260, CLX-8640 and CLX-8650, offering output speeds from 18 to 48 ppm. Lastly, three A4 printers are also out - the CLP-360, CLP-415 and CLP-680 with speeds from 18 ppm to 24 ppm.Full technical specs coming very soon on DMO!